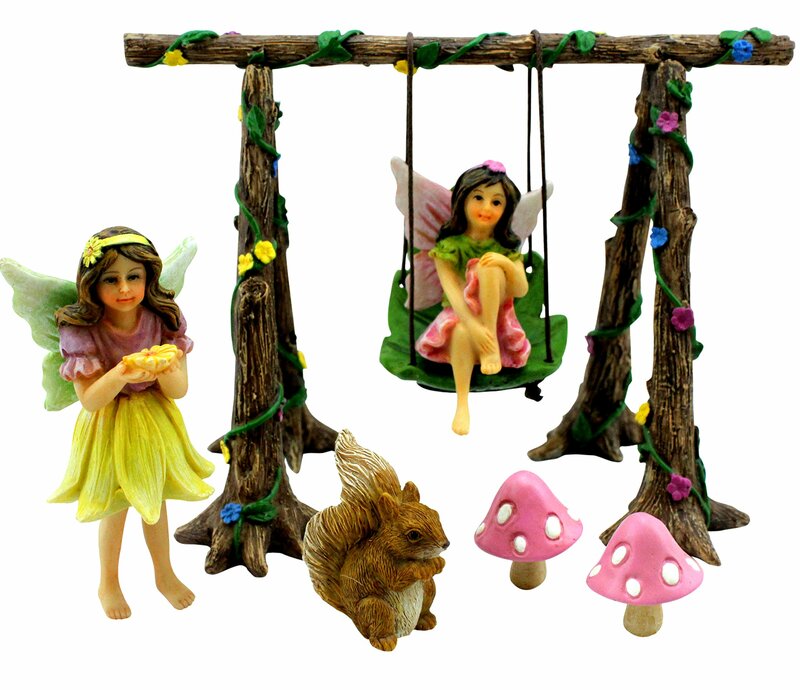 FAIRY GARDEN SET: This perfectly crafted miniature Swing Set is very cute and will put a smile on your face! 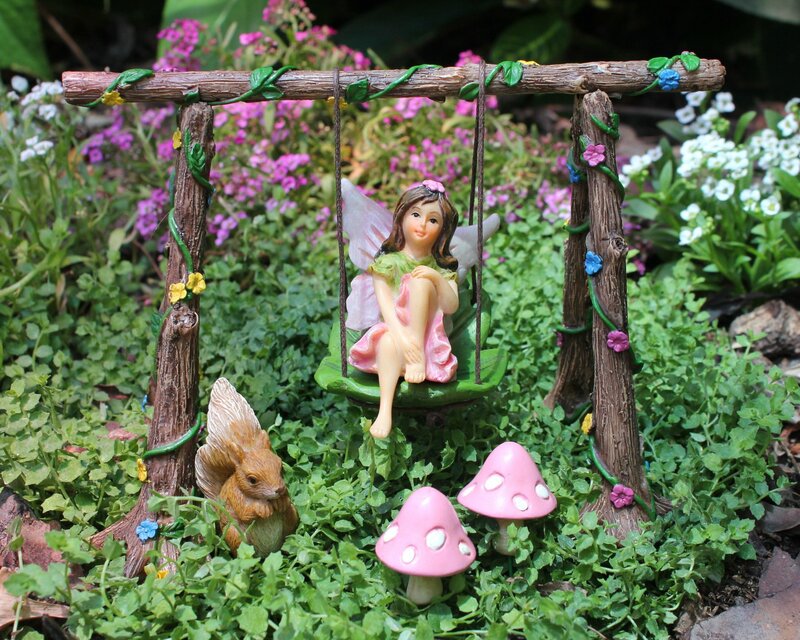 The items have remarkable detail and, the garden fairies Avie & Stella, have almost lifelike appearances. 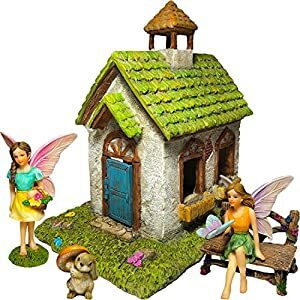 It is a great starter kit for fairy gardens and perfect to use in a terrarium or combine it with your favorite Fairy House. All accessories are made of long-lasting resin and are HAND PAINTED with UV resistant paint, making each item UNIQUE. 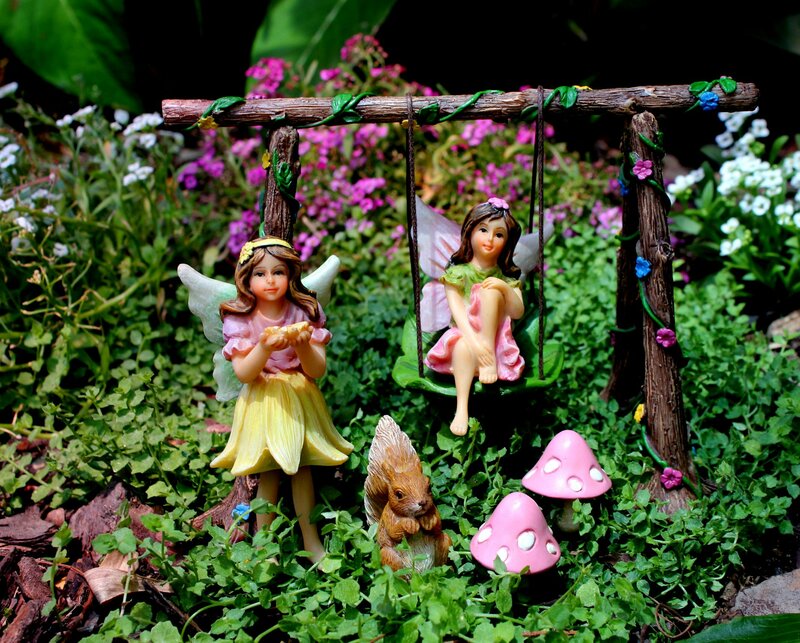 FAIRY GARDEN FAIRIES (approx. 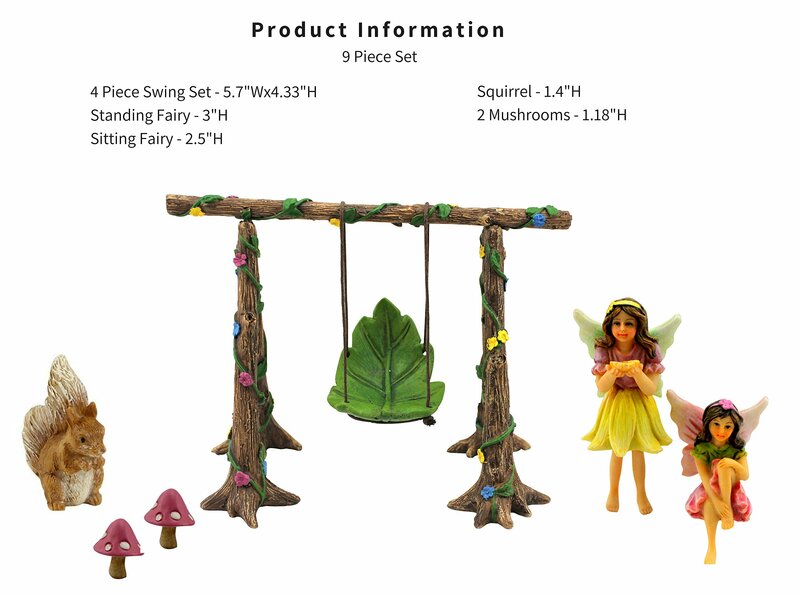 ): Avie, the standing fairy, is 3″ and the fairy on the swing, Stella, is 2.5″ high. 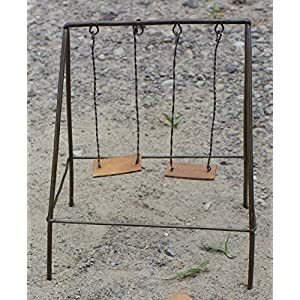 MINIATURE ACCESSORIES: The Swing Set is 5.7″ Wide and 4.33″ High. 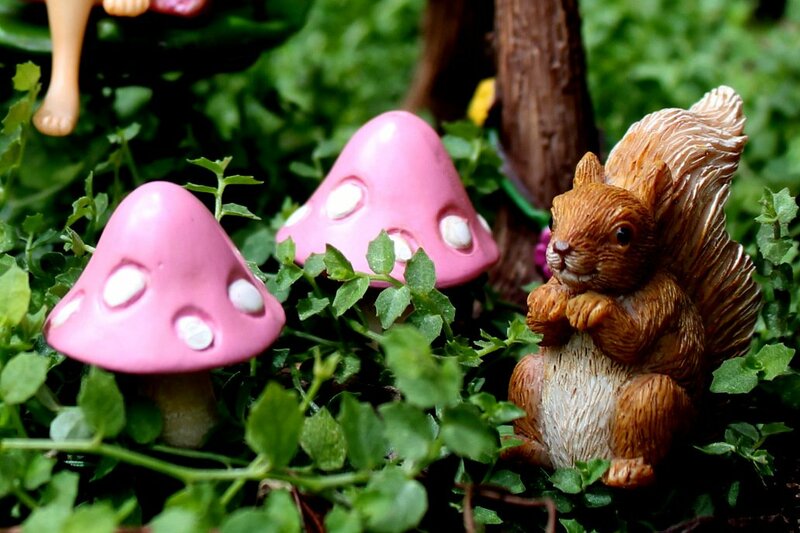 The mushrooms are about 1.18″ high and the squirrel is 1.4″ high. 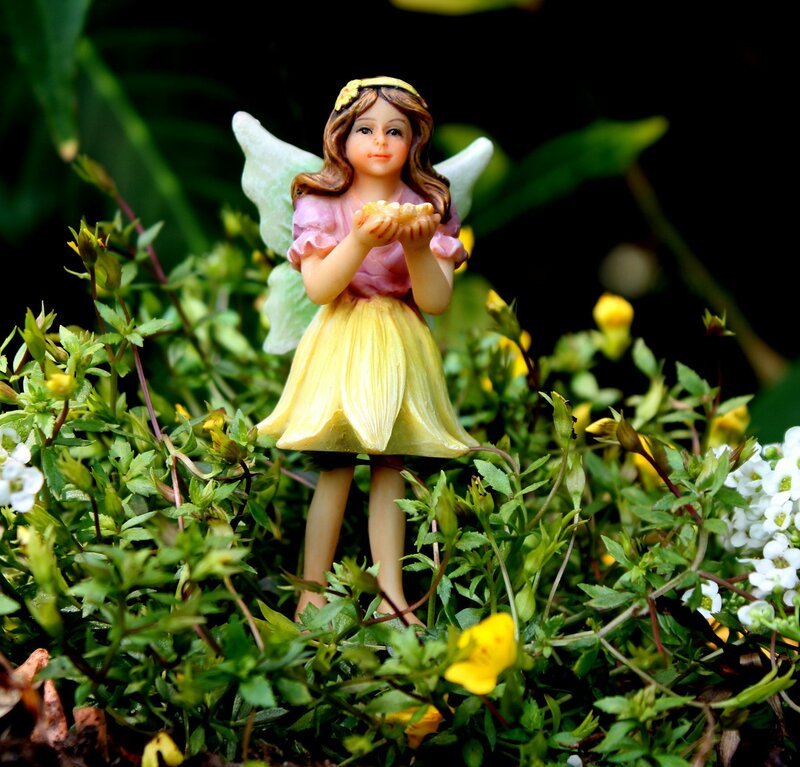 Join Avie and Stella in their magical playground. Everybody enjoys the company of these two. From Grandparents to grandchildren, time seems to fly when we all play together and allow our minds to get carried away – just a little bit. This kit is ideal for indoor or outdoor use and would make an awesome gift for anyone, big or small. 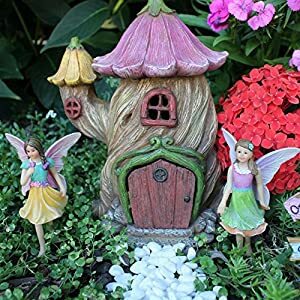 All items are hand painted with a UV resistant paint and it is recommended not to leave the resin products in direct sunlight for extended periods of time as continuous direct sunlight may cause the items to fade. Polyurethane spray can be used to protect the paint from fading should the items be exposed to direct sunlight. 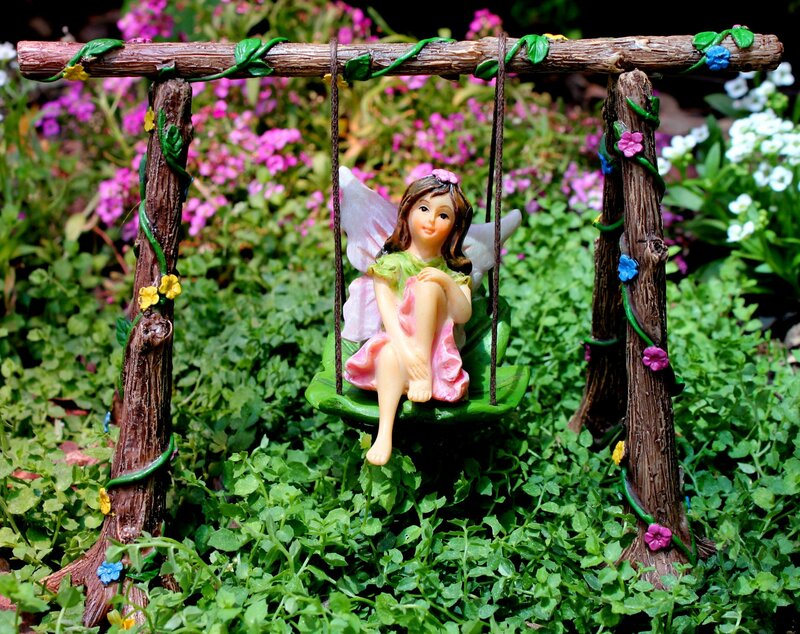 Also, we suggest you use Blu-Tack to secure Stella on the Swing Seat to prevent her from accidentally falling off. Click The Add To Cart Button And Have a Great Time With Avie and Stella! 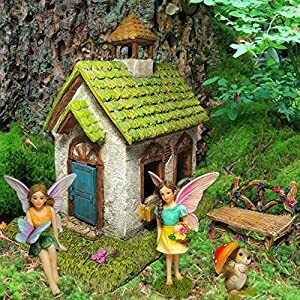 FAIRY GARDEN GIFT: The Miniatures makes a perfect gift for Birthdays, Mother's day, Christmas and Graduations gift or simply to SPOIL YOURSELF. All ages love it, adults and kids! 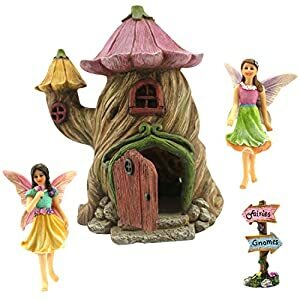 FAIRY GARDEN PACKAGING: The ornaments are carefully packed in a specially cut out Styrofoam container to protect each item. We will replace any item damaged during shipping.